When making plans for new landscaping, lighting may not be the first thing that comes to mind. 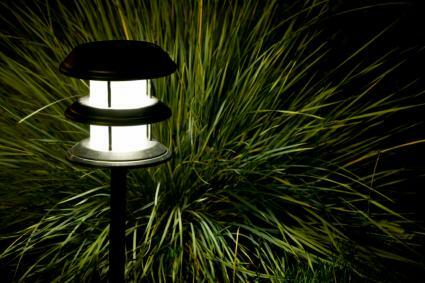 Homeowners tend to think of the landscape as a place to enjoy primarily during daylight, but an outdoor lighting system makes a garden inviting for nighttime relaxation. Outdoor light fixtures are classified based on the breadth of the beam that they project, which in turn determines how they are used in the landscape. Narrow bullet lights have an elongated housing over the bulb that focuses the light in a thin stream. Wash lights emit a wide glow and do not feature housing over the bulb. Spotlights have an acute angle of illumination, though wider than bullet lights. Flood lights shine in a wide angle, but are not as broad and diffuse as wash lighting. 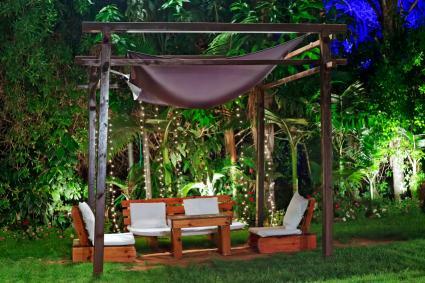 There are also two general orientations for outdoor lights which create very different effects in the landscape. Uplighting is generally used for illuminating objects - plants, statuary, structures, etc. - while downlighting is used to illuminate space, such as path, patio, entryway or lawn area. 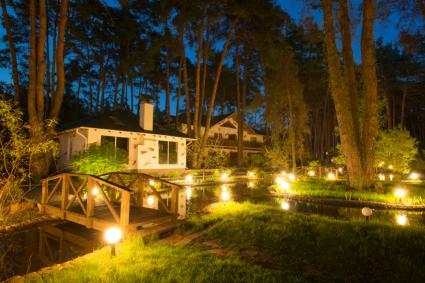 Making the garden glow at night is probably the most exciting use of landscape lighting. If nothing else, you'll probably want to accent your showiest trees with a few spotlights. 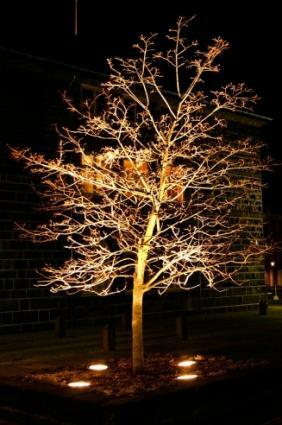 You'll get the most bang for your buck adding lights around short to medium-size trees with picturesque branching patterns, such as Japanese maples, crepe myrtles, and saucer magnolias. Three 20-watt spotlights placed around the trunk in a triangle formation is perfect to create that enchanting nighttime effect. Larger trees that are 30 feet or more in height need several 50- or 60-watt bulbs to provide enough light to illuminate them properly. An alternative approach is to mount a couple of downlights high in the branches to make the canopy glow from above. Place them at the same height about 10 or 30 feet from the trunk (depending on the size of the tree) and face them straight down. Shrubs can be made to glow by mounting an upward-facing wash light at ground level to illuminate them from within. If it's too much hassle to get inside the shrub to mount a light, place the fixture on the backside of the plant (opposite the direction where it will be most often viewed) to create a backlit glow. Perennial borders and beds of annual flowers and vegetables should be illuminated with downlighting mounted on a short post or stake. These are essentially the same lights that are often used to illuminate pathways, but placed every 10 or 12 feet among low-growing plants they give provide gentle illumination for the entire area. If you concentrate on white-flowered plants, you will have a romantic 'moon garden', as the blossoms pick up the light and reflect it back to the sky. Large open areas require strong downlighting to give even illumination . You'll want to use flood lights for this purpose, whether mounted from overhanging tree branches, the side of the house or from lampposts. The facade of the house, gazebos, sheds, statuary and other outdoor structures are equally important to consider in your lighting scheme. Bullet lights come into play when there is something very particular you want to illuminate, such as a statue, street numbers, or mailbox. In this case, you will want one light shining from each side of the object to prevent shadows from obscuring it. Mounting bullet lights at the corners of the house at ground level, facing up, is a dramatic way to frame the facade. Spotlights mounted at ground level every six to eight feet is a nice way to illuminate the front of the house that is quite effective when viewed from the street. Wash lights are nice to create splashes of light along large, oblique surfaces, like the sides of the house or a privacy fence. Space them widely, every 10 or 15 feet, so there is dark space between each one. Where outdoor lighting is used to illuminate a patio, deck or any area where people will be spending time, downlighting is generally in order. Otherwise, the light will shine glaringly in your face. These can be mounted on edge of the house, from overhanging branches, on posts or along railings, walls and fence lines. Floodlights are useful when you need to see things in detail, such as around a barbecue grill or outdoor kitchen, but it's best to mount them as high as possible to prevent glare. For gentle lighting that makes it inviting to just go out and enjoy the night air, wash lights are your best bet. A completely illuminated landscape is good for security purposes, if that's your primary concern, but otherwise it's more effective to have dark areas punctuated with varying points of illumination. For the best effect, alternate different lighting styles in each part of the landscape - softly glowing downlighting in some places, a few sharp bullet lights in key locations and spotlights to create accents throughout your property. Aiming your lights is critical to success. Accent lights should not just illuminate the trunk of a tree or the bottom half of a wall, but be aimed to cast light over the majority of the object they are shining on. In general, aim tree lights so the center of the beam is roughly at the point where the main trunk splits off into the branching structure. Likewise, aim accent lights about halfway up the height of the structure or object they are focused on. In most cases, downlights should be aimed straight down to cast an even glow and to avoid excessive shadowing. 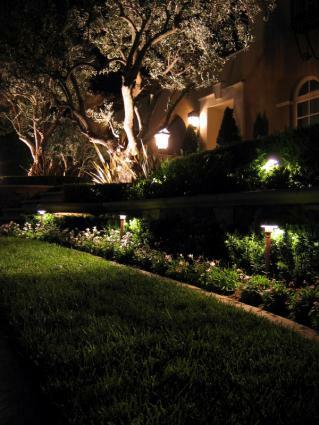 Landscape lighting is an art form unto itself that opens up another world of garden design. Plus, outdoor lights create a warm, inviting feeling in the landscape, making it much more likely that you will enjoy your garden after hours.